The best common practice is to deliver the DCP in a Cru Dataport DX-115 hard drive caddy with USB 2/3 adapter. These hard drive caddys loads directly into a lot of digital cinema equipment. Like Dolby/Doremi and the new Sony media block. -Some film festivals only accept Cru-DX115 hard drives. -You are now allowed to have many DCPs and Assetmaps on the same hard drive according to the ISDCF Disc File Format guide and updated SMPTE standards. Replace the USB 2 cable with a USB 2/3 cable. You could use a USB 2 /USB 3 hard drive like the Rugged Lacie mini 500 gb. These USB 3 flash drives are fast, but you will only get USB 2 transfer speed on older digital cinema equipment. But a USB 2 transfer speed of 25-35 MB/sec is still much better than the 5-10 MB/sec transfer speed you get on some older/cheaper flash drives. If the cinema transfers the content on the flash drive to their own DX115 hard drive they can get 60-100 MB/sec USB 3 transfer speed to the DX115 and 100 MB/sec speed from the DX115 to the digital cinema equipment. Doremi and Sony (and others) support MBR NTFS, but the recommended format is the linux format Ext 2 or Ext 3 with a inode size of 128 that is read and executable only. -Ubuntu Linux run from a USB pendrive made with USB linux creator. -Ubuntu run in virtualbox on a mac. Read more here. You can copy the DCP to a inode 128 read and executable only EXT2/EXT3 hard drive in many ways. Use add partition and format the drive as ext2 or ext3. Note the name of the partition (like sdb1) and format it again in terminal with -I 128 inode. Run sudo Nautilus in Terminal to get a root GUI file manager. Then copy the dcp directory to the harddrive in the Files/Nautilus file manager. In Terminal use the chmod command on the folder you made. To make the ext 2/3 partition without reformatting you can use parted. openssl sha1 -binary "FILE_NAME" | openssl base64. If you use Extfs for windows or Extfs for mac to mount the linux harddrive you can enable it to be mounted read-only. MBR NTFS 1 partition hard drives are readable by all digital cinema equipment and are used on some DCP hard drives. If you are formatting a 1 partition MBR NTFS hard drive on a mac (high sierra) you can use Paragon NTFS for mac to format the hard drive in disk utility. In disk utility enable “show all devices” in View in the top left corner so you can choose the hard drive. When using erase (format) choose Master boot record as the scheme when formatting as Windows NT file system. If you are formatting a 1 partition MBR NTFS hard drive in Windows using Computer Management – Storage – Disk Management you can right click a hard drive and see in the Volumes tab if the partition style is Master Boot Record. Cinema DCP players often use the Linux OS and it does not natively support exFAT formatted hard drives. Do not use folders inside folders like this: /DCP/MYFILM. Use only 1 partition on the hard drive. The name of the folder will not be shown when ingesting the DCP on a Doremi. An external (USB connection) hard drive is great for portability, but its data transfer rate will be less than 10MB/sec. So if your content is a trailer or a short movie it won’t take that long to transfer. However, a full 120GB DCP file will take longer than 3 hrs to transfer + the verification time on top of that! If the theatre has the time to transfer it – great. But don’t expect to just drop it off the night before a screening. A friendly reminder from your independent cinema’s projectionist. 10MB/s x 60/s = 600MB/min. 120,000 MB / 600MB/min = 3 hrs, 20 min! Verification is typically 1/2 the time it takes to transfer so let’s say an additional 90 min. You’re now up to almost 5 hrs (and I’ve been generous in the transfer rate)! It is true that a USB 2 pendrive can have really slow transfer speeds like 5 MB/S or 10 MB/S, and if a doremi server is busy playing a movie the transfer speed will be 10 MB/S for all sources. But USB2 is faster than 10 MB/S, it can reach 40 MB/S. A USB 2 harddrive usually have a transfer speed of 20-40 MB/S on a Doremi server and a 80 GB feature film will transfer in an hour with verification. A CRU Sata harddrive docked in the server or a gigabit ethernet transfer will have a transfer speed of 80-100 MB/S of a 80 GB feature film will take 20 minutes with verification. you could also use a Linux live USB key and make the directory with the DCP read only and executable like I described in the post. True, I have found that Dolby servers will only play nice with drives formatted “Master Boot Record”. I use format MBR for all DCP delivery using Ubuntu. Hello. We have a MacPro running the latest version of OSX and have been using the trial version of easyDCP to create some tests prior to purchasing the full license. The problem we are now having seems to be the compatibility between the Mac and the Linux formated external drives that we are trying to load the DCP files onto. Any suggestions? We’ve tried two different versions of Linux and they keep crashing. One suggestion was that we network a PC to the Mac and simply use that to transfer onto the external drives. Again, any suggestions would be greatly appreciated. I have to think that other people have solved this problem. I run Easypeasy Linux on USB pendrive made with USB linux creator. You should be able to copy from windows and mac harddrives in linux to the linux harddrive. I run a dolby dss200. I need to make room for new content but do not have a Linux computer nor do I know anything about its operating system. Anyway to use a windows or mac system to transfer content ( trailers, unencrypted ) to an external HD? I received an answer to my question and wanted to share it in case others have the same need. The second link is for an ext2 volume manager…that’s so you can give a drive letter to the drive and drag and drop dcp files to and from it on your computer. Don’t be discouraged if you have to format it a couple of times … it usually works the first time, but I’ve had to re-format a drive a couple of times before the dolby would recognize it. I used final cat pro for my final cut. then used Wraptor (Only for mac) to export film via compressor 4. Upoladed (Via USB 3) to sony 2K/$K projector and got great result. Used just regular portable Hard Drive. But i would like to have one that can be uploaded to doremi server. So with all those parts named do they come with power supplies? The docking station has a power supply. I’ve updated the post. 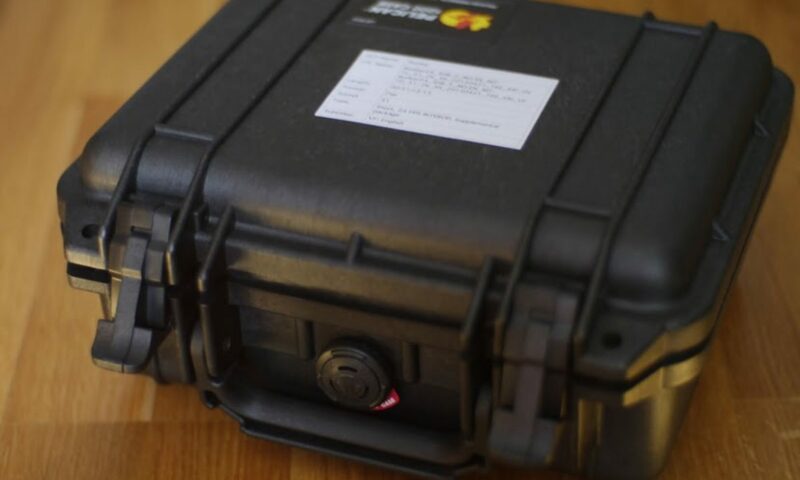 Do you think the pelican 1200 case will fit the CRU + HD + adapter + power plug and cables? Os just the pelican 1400? You can fit everything in the pelican 1200, but you will get less protection. Hi Knut! Your blog is still such a great resource. Thanks also for linking to the great AE plug-in j2k which I use all the time. I’m not knowledgable in Unix at all, but I recently installed Ubuntu on an old Dell to be able to format devices in EXT3 with an i-node of 128 which is something Tuxera or the likes don’t seem to do on a Mac. Some festivals demand ‘DCI-compliant’ EXT3 i-node 128 carriers. I really wonder which D-Cinema server won’t ingest from an NTFS formatted drive..
where sdb1 is the port in which you’ve plugged your external storage device. To check where it is, type the command ‘mount’ first. Or do I need to go through your method to be on the safer side? Hi. MBR, inode 128 and chmod 755 is recommended. EaseUS Partition Master and then paragon ExtFS for Windows to copy your DCP to the drive. They have a Doremi? server and Christie 2K projectors. I put the file on a normal cheap flash drive and nothing showed up at the theater… What should I do differently to transport my DCP to the theater? We have 15 student films scheduled to play in 3 days and I need help. I downloaded the trial easyDCP to be sure my DCP file would play and it did. Sounds like you have a GPT or Exfat flash drive. I updated the post with a description on how you can check if you have a 1 partition Master Boot Record NTFS hard drive/ USB pen in Windows. The people working at the cinema should be able to copy the content to a working flash drive. Hi, What are the rules on the naming of the first folder of the DCP? Also can that folder be re-named? Question, why does a USB3 stick like Corsair Flash Voyager Slider 128gig take SO much longer to format then a 1TB HHD USB3 drive. Also I’ve heard it is not good to use hard drivers 2TB or larger for DCP’s. But since 500gig drives are almost impossible to get and 1TB drives are going that way also. What will be the plan?